. . having a neutral international trading unit of account - for a stable economic value to flow across the Internet! Cloudfunding reverse engineers the advertising dynamics and commoditizes the value into a financial trading unit that gives businesses and customers access to real time Supply and Demand productivity - real time data that raises the bar with decision making. The New Digital Economy operates in a new dimension where productivity is able to be tracked in real time - this ability offers a new paradigm in measuring and distributing economic growth at a mico level, and, avoid the need to rely on inflation to increase prices so the illusion of growth can be achieved. 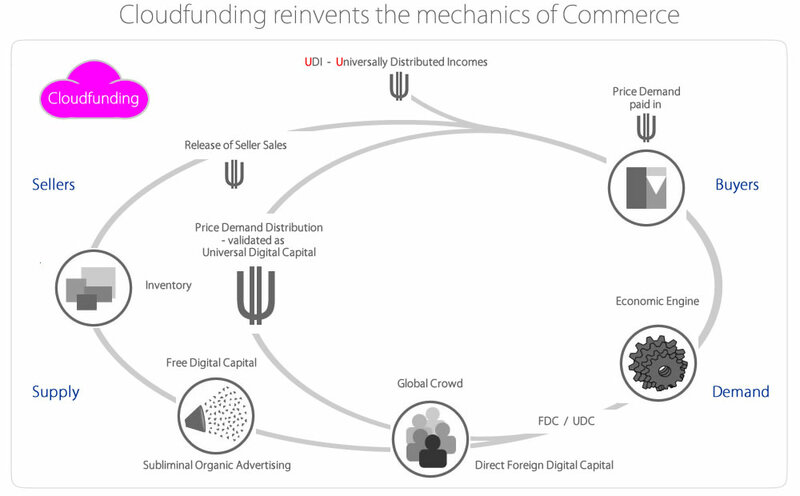 Cloudfunding operates in a new paradigm above B2B and B2C, it operates from economy to economy with e2eCommerce spanning across the world in a seamless flow of Supply and Demand between local and global Buyers and Sellers. A neutral Universal Digital Cash moves past the draconian boom and bust business cycles of the Old Economy, and goes back to a modern version of the Gold Standard that is indelibly tied to genuine productivity, something that only digital technology can achieve with economies of scale. This is where real-time Price Demand achieves the ultimate benefit of collecting data that can pin-point with accuracy whether selling prices either increase or even decrease in the Global Pricing Index, to achieve the maximum economic growth. The Old Economy pushes credit and indebtedness forward before there can be any productivity, leaving the debt to be recovered over a time frame - inflation is used to increase prices like houses to compensate for the extraction of fees that shift to the money lenders, and cause the inequality gap to increase. It doesn't matter if it's the fault of banks that just sell debt as a product for people to buy as credit, or it's the governments that fail to take responsibility of the current debt sitting on the shoulders of the private sector - the issue is how to transition over to the New Economy without accumulating debt. Using binary economics as the core value mechanism to keep the New Economy stable and true, is the only way for economic growth to scale exponentially - commodifying advertising as an economic value to operate as a global trading unit of account in Global Binary Markets provides the necessary inter-connectivity for Free Open Market Economic Zones to set a positive course - all transparently displayed in the Global Chamber of Economies in real-time. It's now a digital economy, silly! 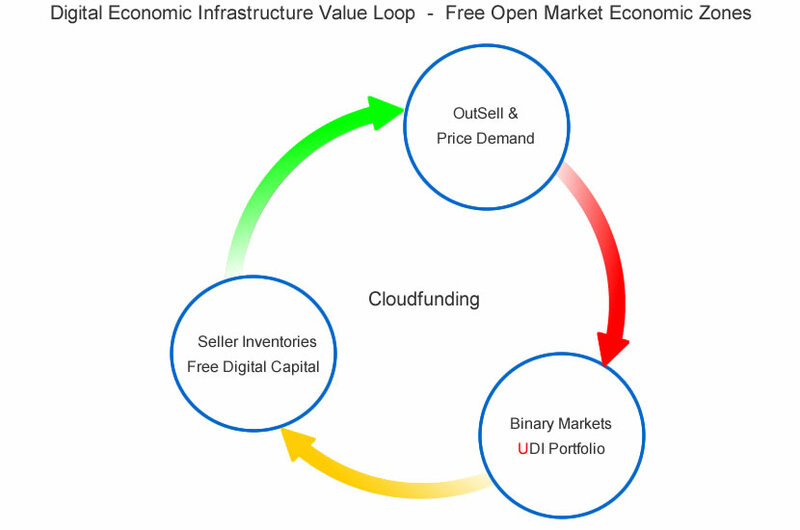 The New Digital Economy has until now operated with a missing economic infrastructure value - Cloudfunding solves that conundrum with a global economic infrastructure value that backs the New Digital Economy ubiquitously, in real time - that economic value begins as Free Digital Capital - it's binary and anchored to true productivity and is distributed as free working capital for the global users to generate their own strategies to drive productivity - active Users then share the benefit of the global productivity with the validation from all the Buying Prices paid in Price Demand, and through the growth in UDI Portfolios. The New Digital Economy's economic infrastructure value will operate independently from an inflection point where the global crowd directly controls the future growth and wealth sharing of economies - the democratic consensus of the global crowd will replace the money lenders but share all their benefits - replacing any need for inflation with sophisticated algorithms that adjust pricing indices in real time. The timing of the global crowd having control at the intersection between Supply and Demand has great importance with the increased automation and robotics takeover of jobs - it coincides with the massive global change in the demographics, and if left to the old feudal rent seekers their methodology will only push societies further into debt - the binary infrastructure mechanics in Cloudfunding ensures that can never happen. . . it's free working capital, it's free to earn and collect, there's no interest or fees, and never needs to be paid back, ever! The incentives - OutSell gives Sellers their full Selling Prices, that now meets at a equilibrium point where Buyers have the incentive to pay the price they want to pay with Price Demand. The flow of value in commerce and trade in the Old Economy has always moved from Buyer to Seller with parity of what a Buyer pays is what a Seller gets - the New Digital Economy changes the flow of value by directly financing the Sellers inventory for free, leaving the Buyers to be incentivized with Price Demand to pay the price they want to pay. With the Old Economy's model that continually moves from boom to bust, it becomes a battle when Buyers deleverage themselves from debt built up with easy credit during the boom - the instinct for consumers, businesses and even governments in the downward part of the cycle is to tighten the belt and begin saving by cutting back on spending and Capital Investment, which reduces micro and macro economic growth. What the New Digital Economy does, is it avoids the Paradox of Thrift ( deleverage and aggregation ) by maintaining the business Capital Investment with full economic growth, while simultaneously giving consumers the tools to continually delever away from the indebtedness, which has been the Old Economy's mantra to control the money supply. A democratic distribution process within the Direct Foreign Digital Capital Investment - DFDCI allows for those holding units of ownership in locations of productivity to take direct action to restore balanced trade on a country, regional, city, business and an individual scale. The volume of ownership has a direct correlation to the share of UDC gained ( LAT ) with the volume of productivity in any location - indicated by the high or low gains from the volume of productivity in the locations. A surplus in countries and regions is indicated by a high gain of UDC from the amount of productivity - two options are used, one is that ownership could be liquidated by those holding the location units, which reduces the overall number of units sharing the new UDC, or more productivity could be directed by the owners and the global crowd through the DFDCI to restore a balance. A deficit is indicated with a low gain of UDC - with similar options to use. Game Theory becomes part of the thinking behind the various parties determining strategies to gain the best possible outcome - ownership volumes and DFDCI cancels out the zero-sum game theory, by always only ever having either a zero or positive growth - the unknown is how positive is the gained share of growth. The size of the markets in the various country, region and city economies provides both domestic and international stimulus - starting with the local Seller wanting to liquidate sales revenue, through to the global users benefiting from genuine productivity - all controlled by the animal instincts of the global crowd sitting between Supply and Demand. 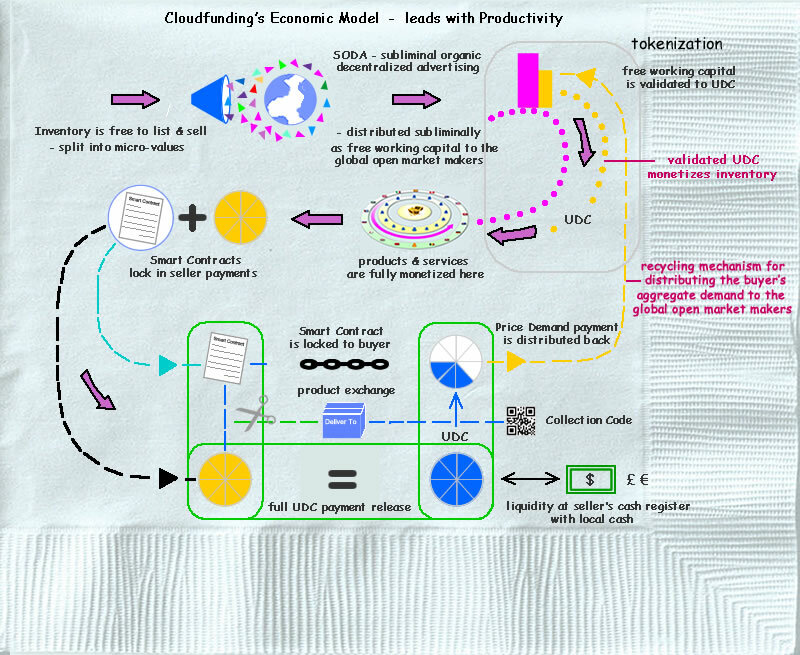 What the New Digital Economy does with Cloudfunding, and in particular with DFDCI - Direct Foreign Digital Capital Investment, is validate the Free Digital Capital against genuine global productivity, allowing it to be globally used ( compared to the limited use of SDR ) to fully democratize trade - removing the incumbents to open up global economies to free open markets with an interconnecting ubiquitous flow with a neutral international trading unit of account value - making it freely available for the people of the world, and countries, to control and operate with in real time, within the real economies. Join the Crowd that's going to get it right - get updates about the coming launch!